Here are your best options for cold or rainy days. A full cab enclosure will keep you warm and dry when the weather turns bad. This guide shows you everything available for your UTV from the manufacturers and aftermarket suppliers. Along with full cabs, we also show you options for add-on heating systems, heated seats, heated steering wheels and heated driving suits. Check out the hot set-ups for riding up in the northern territories. The 976cc HD10 V-twin makes 72 horsepower and has three drive modes­—Eco, Normal and Work—plus four final drive modes—from Turf Saver to locked 4WD. HD8 V-twins make 50 horsepower. 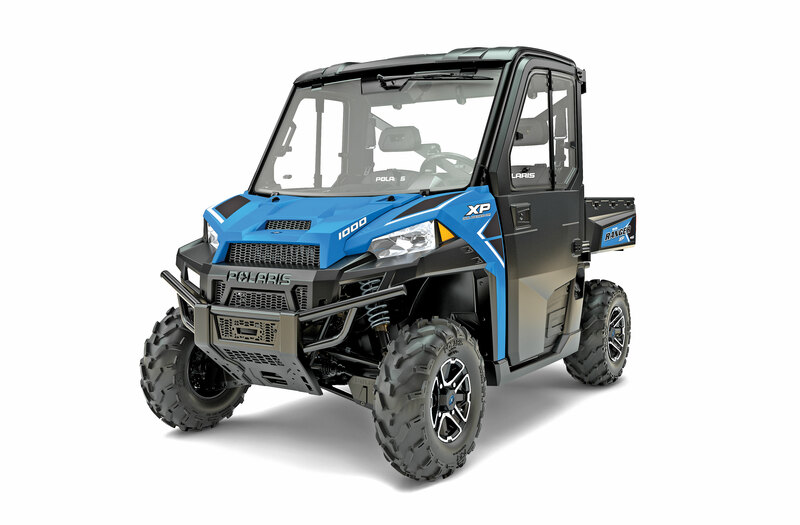 XT Cabs have an enclosed cab with a folding windshield, wiper, doors with electric windows and heater, plus tri-mode EPS, 27-inch Bighorn 2.0s on 14-inch wheels and a 4500-pound winch. Transmission Dual-range CVT w/ EBS & rev. Bed capacity 1000 lb. ; CA, 600 lb. Claimed dry weight 1,822 lb. 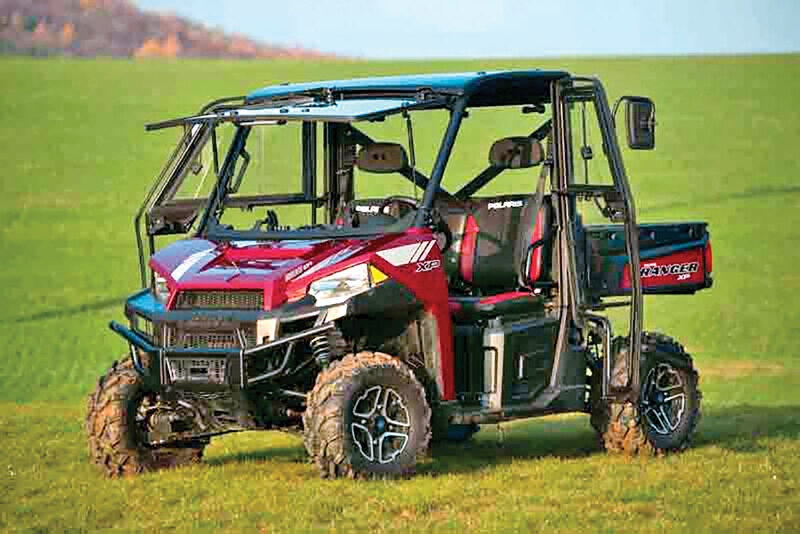 While the 2016 XP 900 Northstar in red denotes an enclosed cab with heater, the Velocity Blue indicates high-volume air conditioning and defrost/heater for the Pro-Fit cabin with a glass windshield and wiper, opening side windows, dome light, rear-view mirror and Cut & Sew seats. Defeat winter freezes or summer heat, humidity and bugs in comfort with the HVAC. Claimed dry weight 1,640 lb. 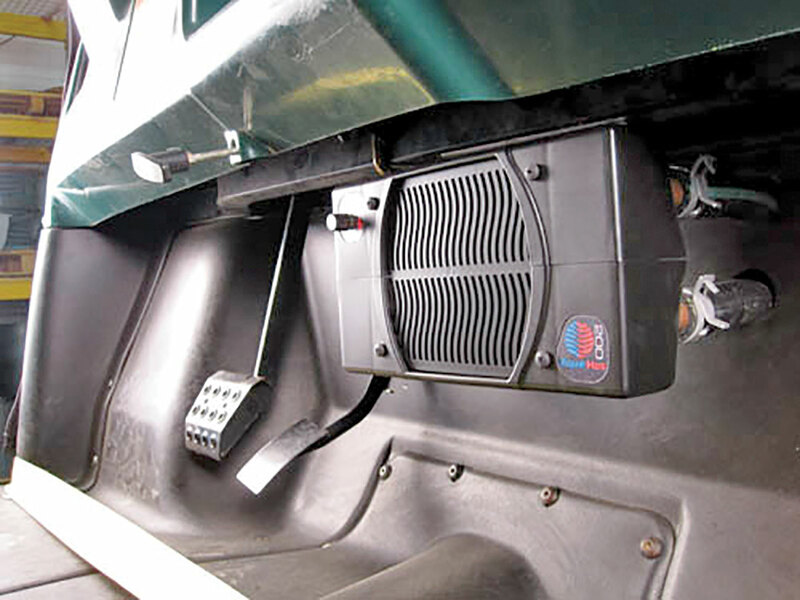 Aqua-Hot offers two different cab-heater sizes for the UTV market. The AH-100 puts out a maximum of 4000 BTU/Hour and the AH-200 maxes out at 6000 BTU/H. 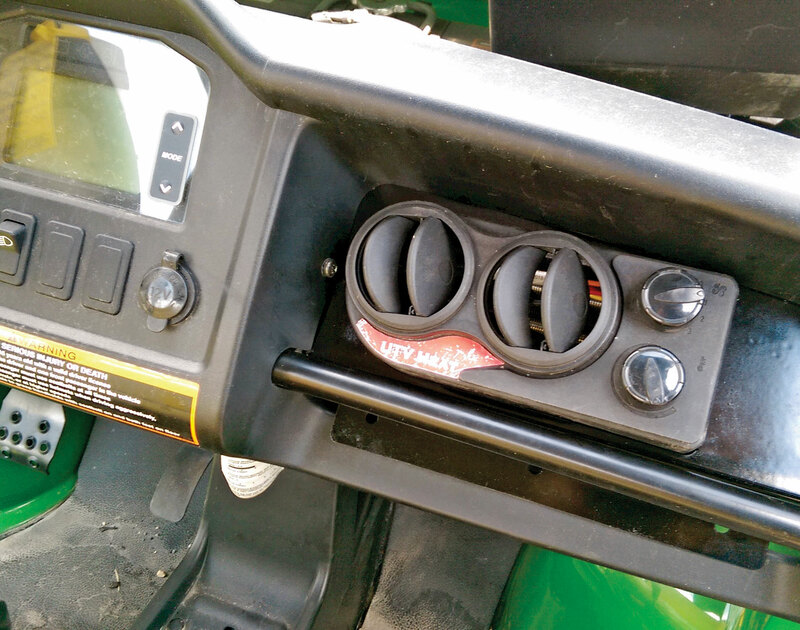 The system operates off your UTV’s cooling system with a high-flow/low-amperage draw fan designed to work off even smaller UTV and ATV batteries. 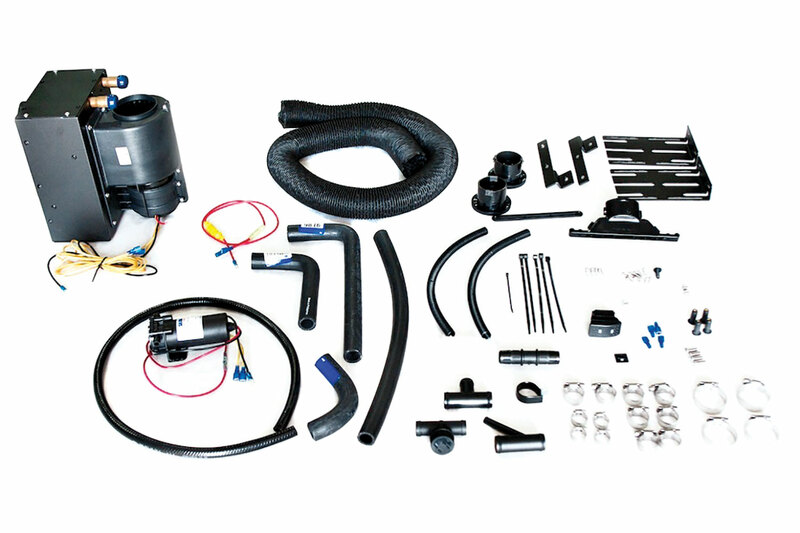 The install kit is designed for pretty much any UTV, including everything you need for a simple DIY installation. 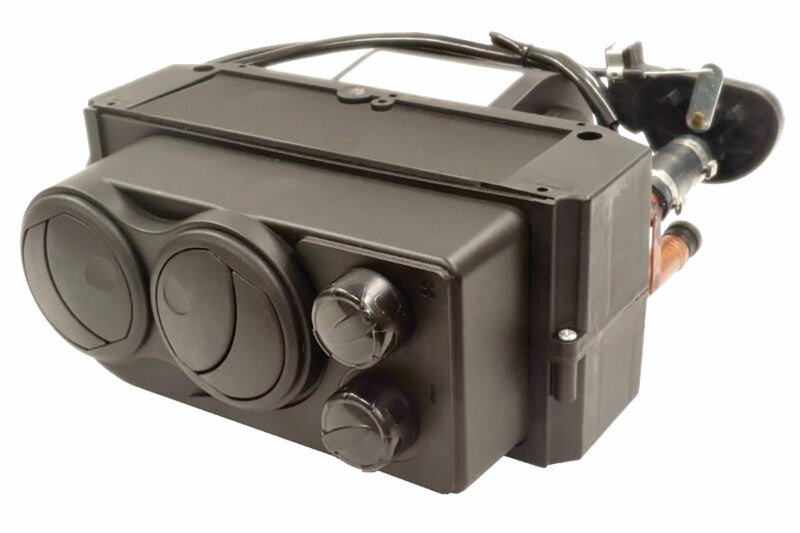 The included patent-pending coolant diverter manifold lets you balance the proper coolant flow rate between the engine and the cabin heater. You can also close the cabin-heater circuit during summer months without disconnecting. Firestorm cab heaters by MotoAlliance provide the flexibility of using your UTV comfortably in sub-zero temps. 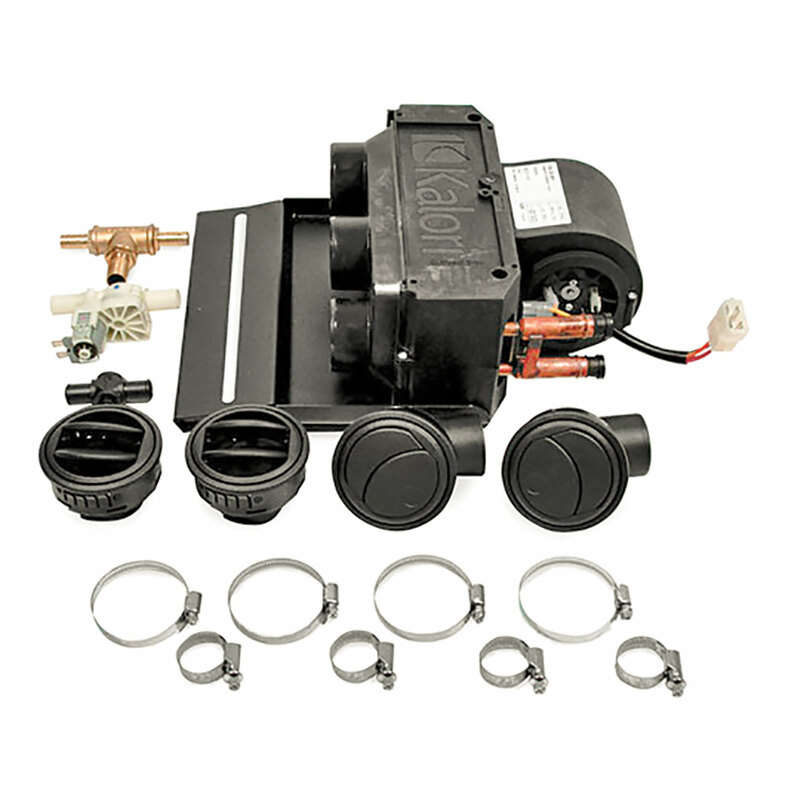 The complete kits include vehicle-specific mounting brackets, hoses, adjustable louvers, hose fittings and electrical fittings for a professional installation. The Firestorm UTV compact cab heater features three fan speeds, a built-in shutoff valve and a three-year warranty. It claims an incredible 14,600 BTU output at 135 CFM. 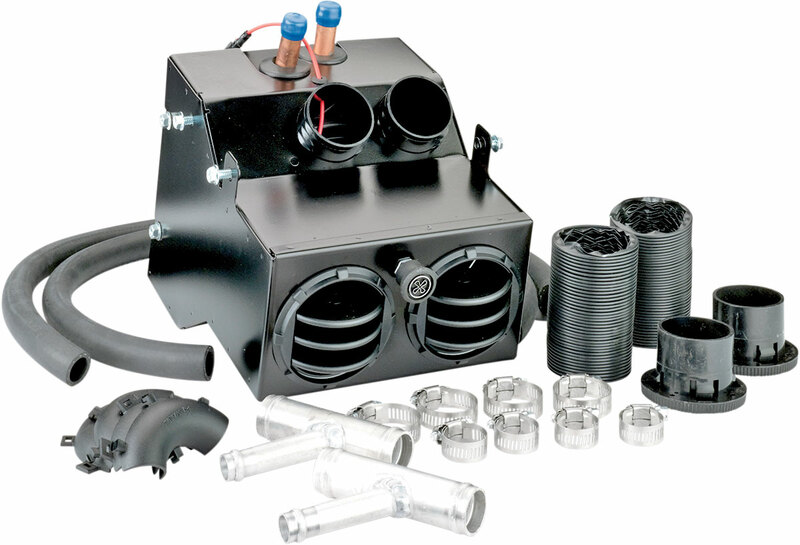 Ice Crusher UTV heater kits come with a compact yet powerful heater unit. 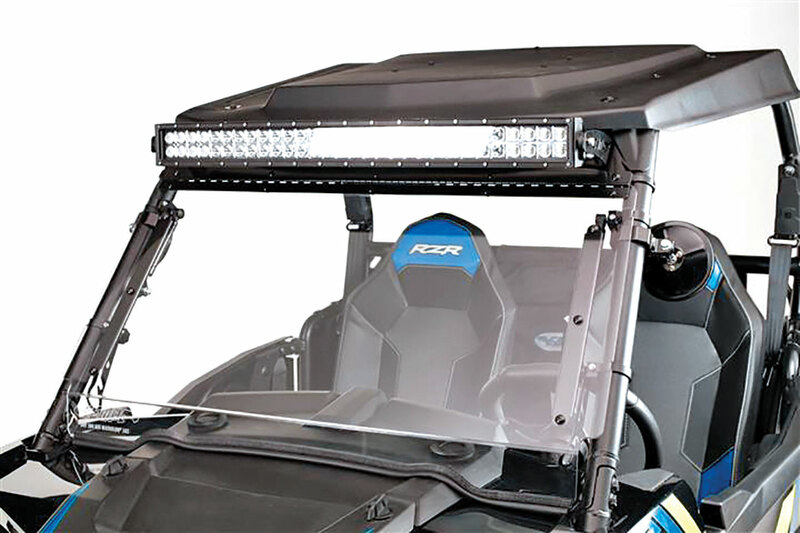 They also include custom laser-cut, powder-coated mounting brackets specific to your model UTV. Available in standard and compact models for those more crowded installs. They have an output of 13,200–14,600 BTUs, and there is also an under-hood 28,000 BTU heater with ducts to the dash with closeable and adjustable heat vents. A full-cabin enclosure is the way to go for winter riding and a definite necessity if you’re planning on adding a heater. 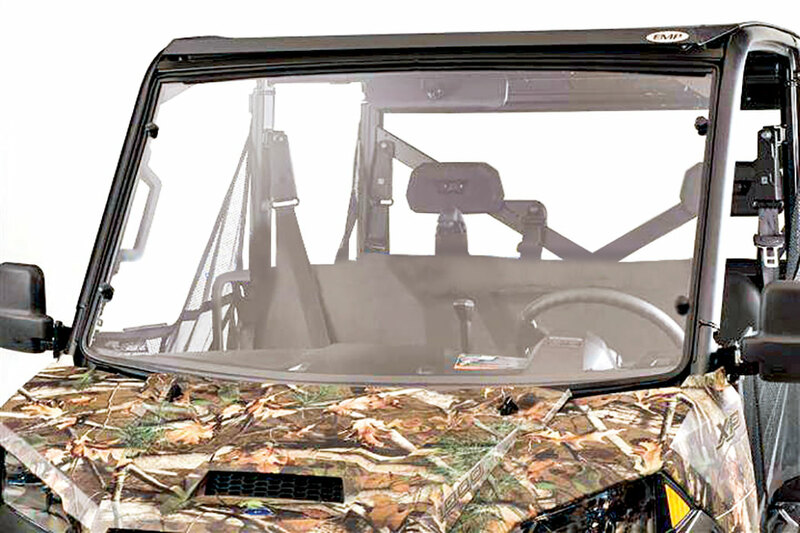 The Expedition cab includes a laminated, tempered safety-glass front windshield with a two-position tilt-out function with gas-cylinder assist. The roof is 13-gauge steel that is zinc-coated and then powder-coated for maximum rust protection. The rear panel consists of 5mm transparent, double-UV-protected and twice-hardened polycarbonate. Doors are made from a combination of safety glass for sliding windows and transparent, double-UV-protected, hard-coated polycarbonate with metal-reinforcing structure. Both doors are lockable and open fully. Moose also has fabric (nylon/vinyl and acrylic) camo enclosures for $524.95–$525.95. heater includes a defroster and all mounting hardware. 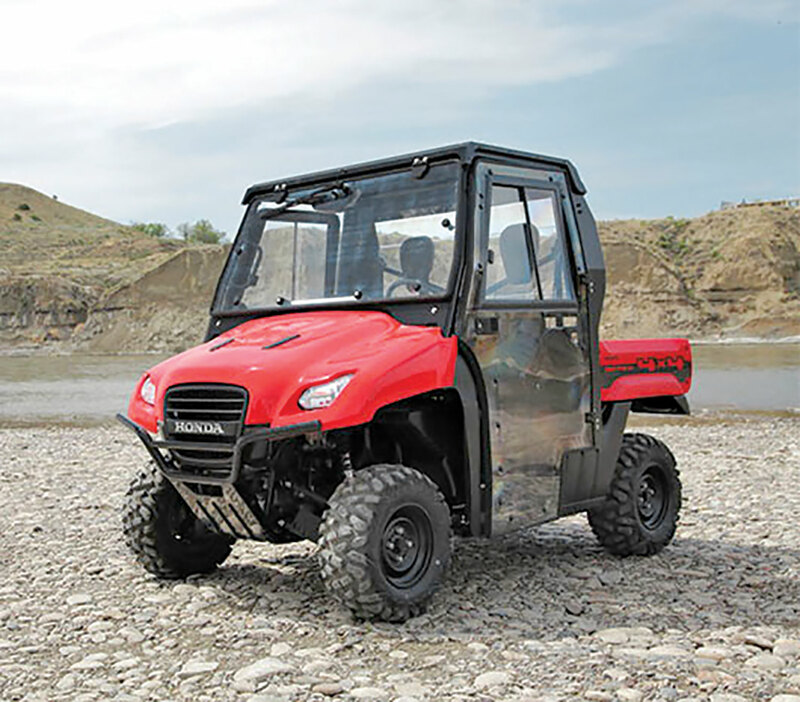 Designed for quick and easy installation that can be completed in an hour on many UTV models, Moose heaters also tap into the UTV cooling system with all necessary fittings, hoses and hardware. The Quadboss enclosures feature high-visibility, automotive-quality features, tough materials and fine craftsmanship. Built for function and durability, they have full-tilting, safety-glass front windshields and 5mm-thick polycarbonate door panels with steel-perimeter door frames. The steel roof is sound-insulated to dampen engine noise. Quadboss cabs are fully trailer-able, even at highway speeds. Kolpin cab enclosures feature full-tilt, tempered-glass windshields that are ready for an easily installed wiper/washer. The Kolpin roof is formed metal and powder-coated black for durability and appearance. A tin layer of foam insulation effectively dampens engine noise. The rear panel and side windows are triple hard-coated for durability, scratch resistance and optimal visibility. Doors are key-matched with door locks. Kolpin enclosure systems are fully trailer-able. The Kolpin 12-volt UTV heater system provides big heat at 4000 BTU with a small footprint that fits under most dashes or on the floor. The variable-speed fan features low-amp draw for long hours of comfort without draining your battery. 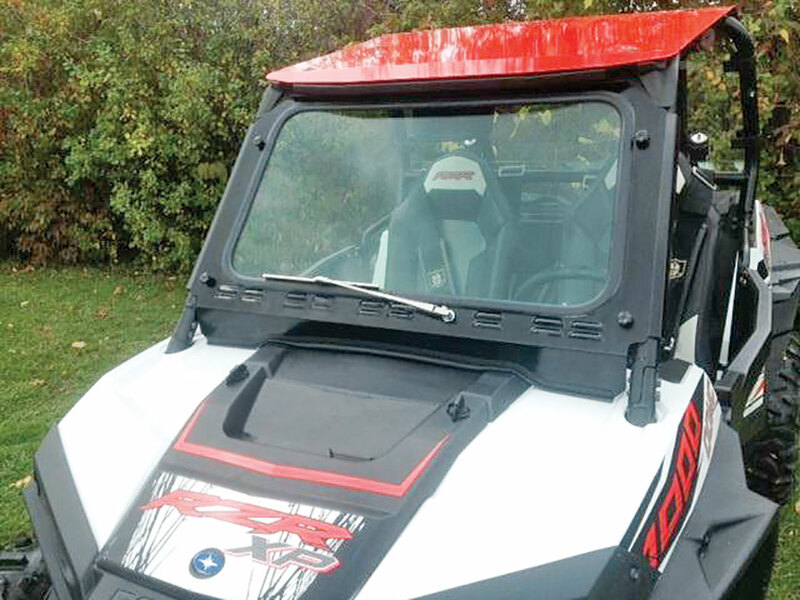 The universal Kolpin UTV heater fits most UTVs with a single installation kit. A windshield should be your first defense against the bitter winter cold. There are many windshield options out there, but the EMP Flip Up is one of the trickest we’ve seen. It can be operated closed, vented or all the way open, featuring two heavy-duty gas struts to hold the windshield open when you want it out of the way. The Flip Up is made of 1/4-inch-thick hard-coated Lexan polycarbonate, mounts in minutes and adjusts between its three positions in seconds. The EMP windshield & cab back combo is a way more effective option than one might think. 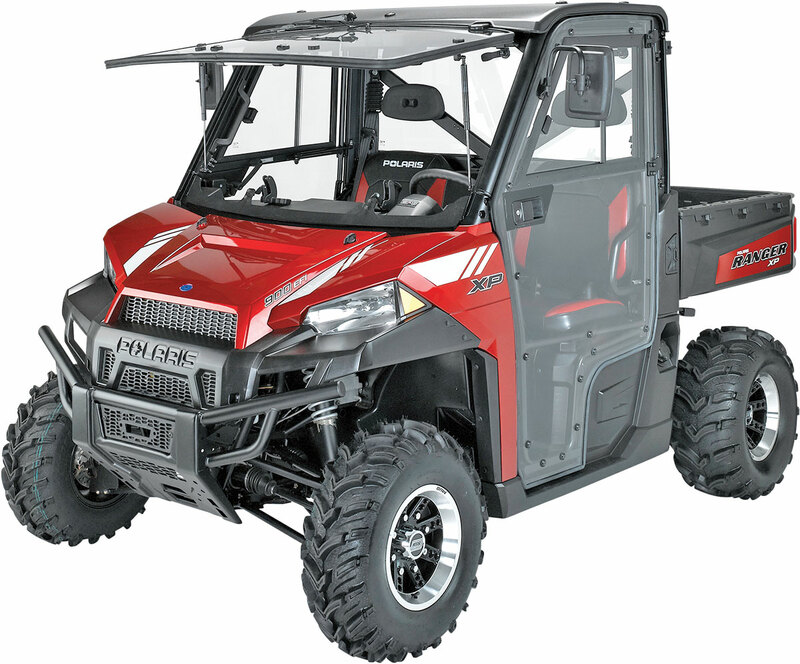 The windshield is MR-10, hard-coated Lexan with tool-less custom thumbscrew installation and removal, and gaskets seal any 60-inch Ranger XP or 570 cage. The rear window is 3/16-inch polycarbonate and fits inside the Pro-Fit cage with one self-tapping screw and full gasket. This EMP windshield features louvers along the bottom of the framework to prevent the vacuum created with many other full windshields. The laminated safety glass is the same material used in most automotive windshields, and it features a hand-operated windshield wiper that can be operated from both passenger and driver-side seats. Freezing-cold fingers can quickly take the fun out of any ride. Short of a windshield, bulky cold-weather gloves used to be the only solution to keeping those digits warm. Heat Demon has changed all that. 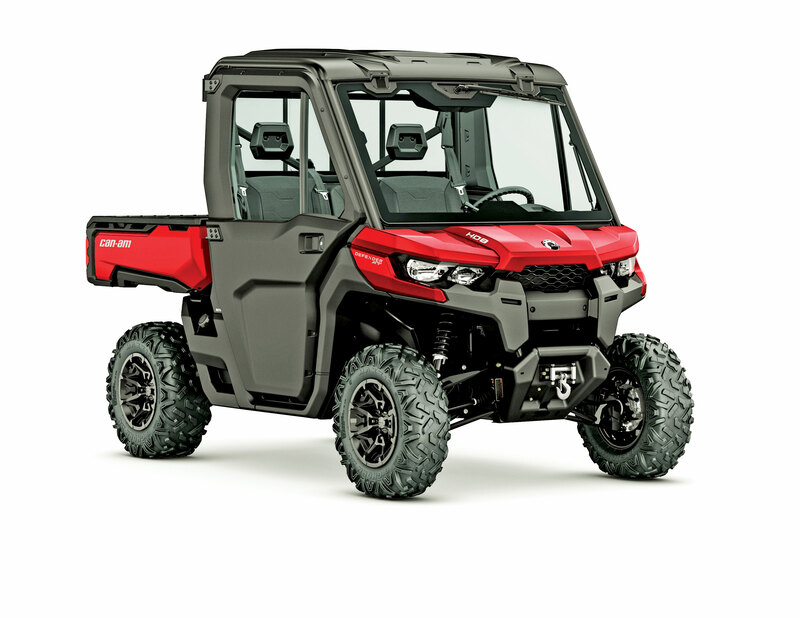 They have combined a performance steering wheel with their patent-pending technology to bring a whole new level of comfort to UTV owners for both work and play. 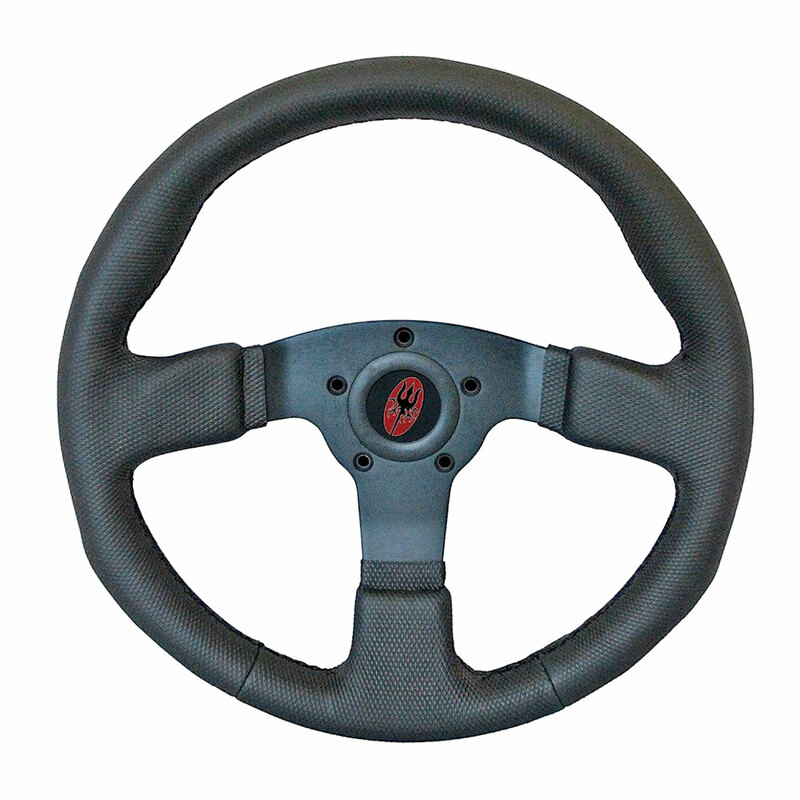 The UTV steering wheel kit draws less than 3 amps and includes a thermal safety cutoff to prevent overheating. 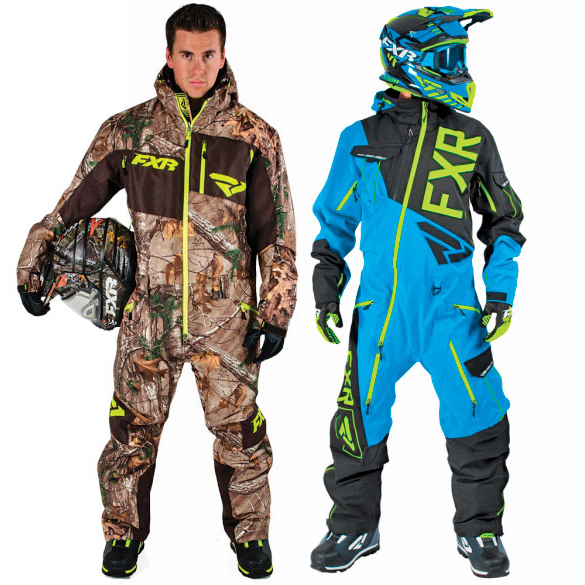 Available for Arctic Cats, Polaris, Bad Boy Buggies, EZ-GOs, Can-Ams and the new Hondas. 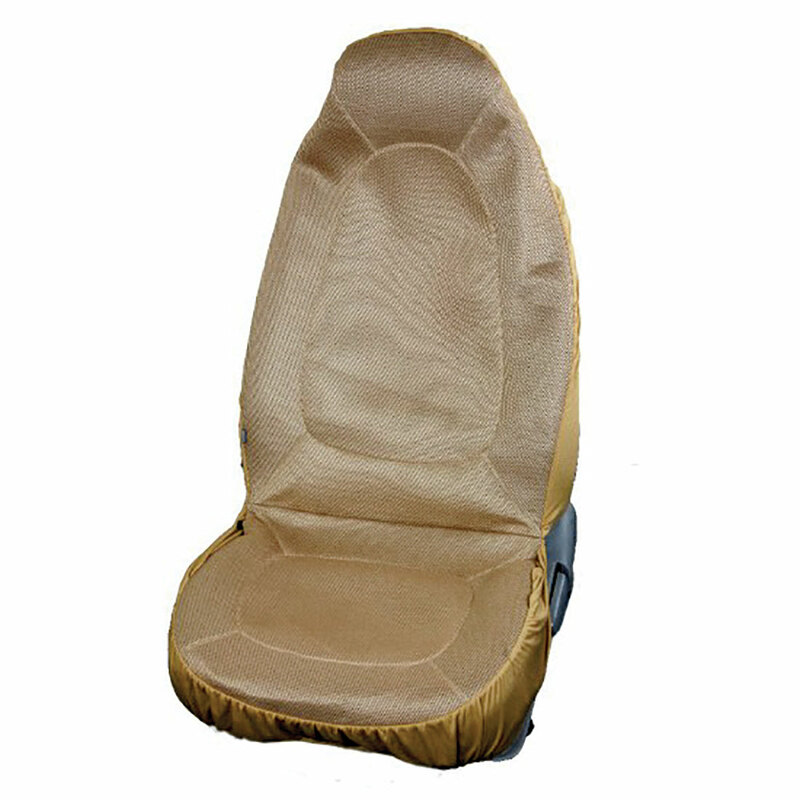 This 12-volt, powered seat cover is sure to keep your backside warm any time your vehicle is running. It features an integrated controller to easily set the desired temperature to your seat with the touch of a button. 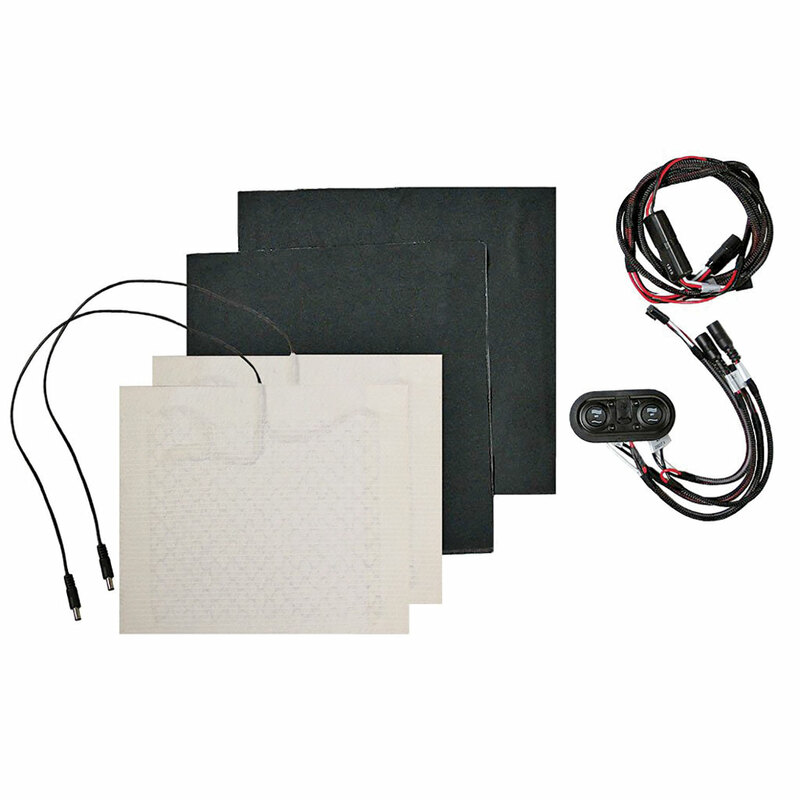 The kit includes a heated car-seat cover, 12-volt power adapter, controller and three plastic carabiner connectors. Venture also has a take-anywhere, heated seat cushion that uses a lithium-ion battery and includes a charger for $69. Putting a little heat in your seat, they claim warmer riding starts at the bottom. Symtec seat kits are available in complete kits for one or two seats, with options for an on/off and a high/low switch. Draws a maximum of 30 watts at 14 volts. Yamaha partners with Heater Craft to heat its Vikings and Rhinos, and the 22,000 BTU heaters have three vent hoses—one defroster and two for the dash. 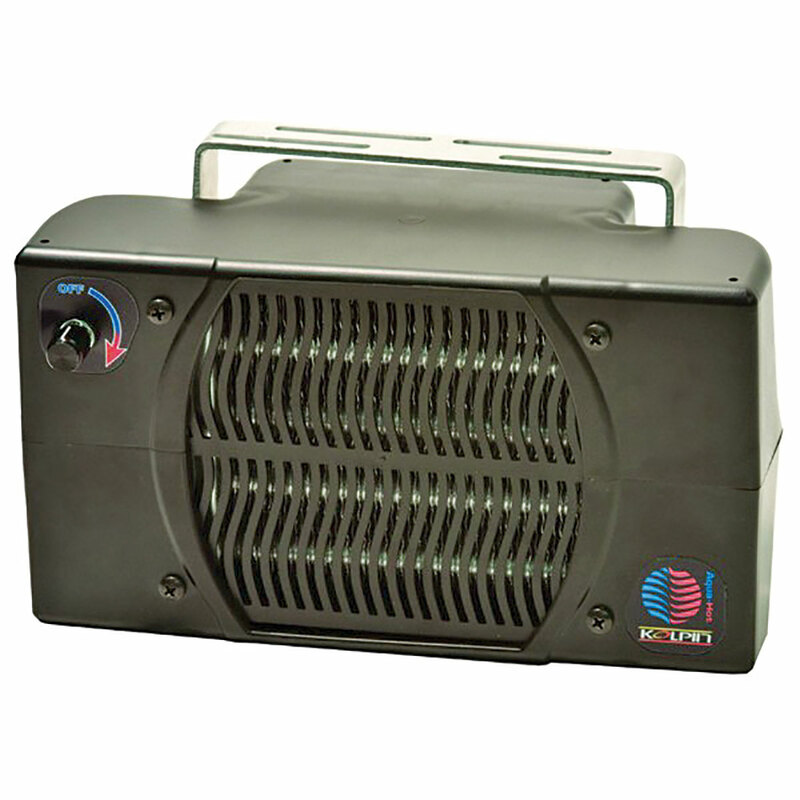 Heater Craft heaters use the UTV’s cooling system and a 240–300 CFM blower to provide maximum heating comfort. Kits include all mounting hardware, a wiring harness, two-position rocker switch and hoses, and draw is 10.5–13.3 amps. Also available for Arctic Cats and Polaris UTVs. available with four different levels of insulation to be ready for any climate. 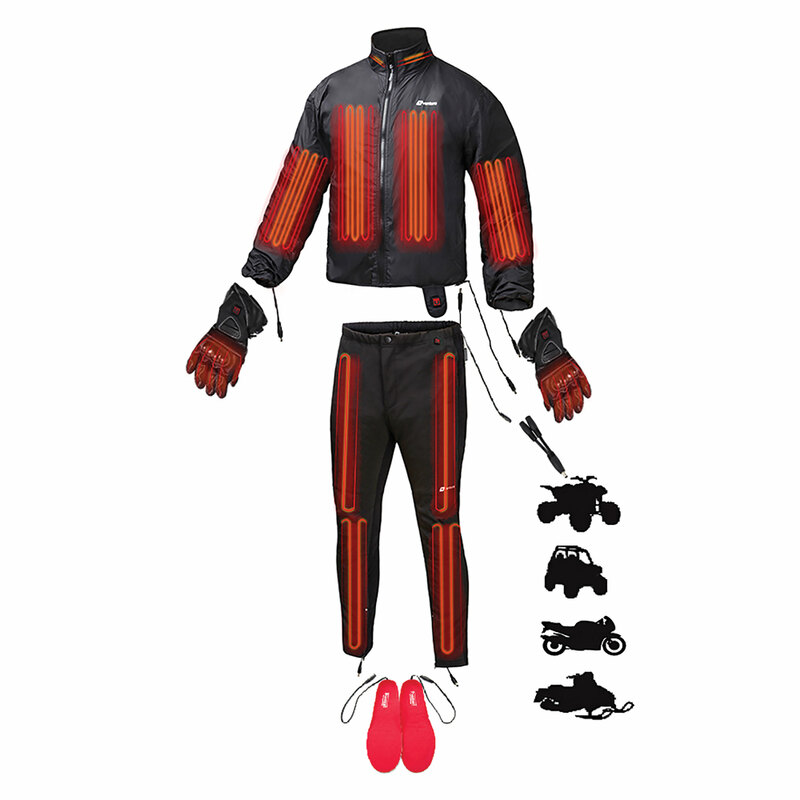 The Lite suits will keep you dry without cooking you, but the Maverick will keep you warm in the coldest of conditions. It’s the onesie for winter riding! Venture Heat uses this same technology as their gloves to make electrically heated liners for your favorite outerwear. From the Deluxe Motorcycle heated jacket liner to the more minimalistic vests, Venture Heat is sure to have the right option for your cold-season rides. The increased draw of the full-size jackets will require plugging it into your machine, whereas the vest and pant liners can still opt for a battery pack. Venture Heat’s heated gloves use high-tech mini battery packs ($99.99 with charger) or can even plug into your machine to keep your hands warm on the coldest days. 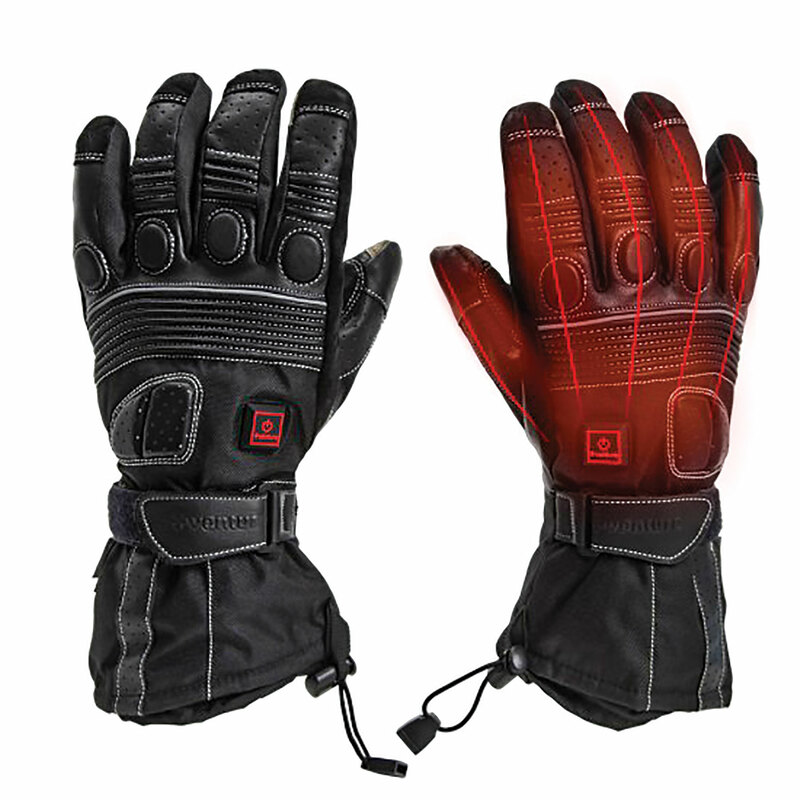 The minimally obtrusive Motorcycle Touring glove is the best fit for UTV and ATV riding, or you can even buy heated liners for your own glove preference. Venture Heat has been leading the industry with both heated apparel and heat-therapy products.